Discipleship Research - Millennials: Bible Readers or Bible Admirers? Millennials: Bible Readers or Bible Admirers? However, comparing the Bible knowledge of one generation of Christian believers with that of another – at the same life stage – is beyond the realms of current data. Simply put, no one has done it – it would be an epic longitudinal project, taking decades to gather any meaningful data since accurately gauging what older generations knew at, say 25, is impossible retrospectively. What can be done however is to ask young adults now about their Bible knowledge, and where it comes from? Two of my research projects asked some of those questions and so what I bring to the table for you to consider is what was reported by 100 individuals – almost all of whom were university educated. Personally, the findings were sobering more than shocking but they have made me re-think what and how I teach – see what you make of them. 72% said their biblical knowledge comes mainly from sermons. In one study of fifty 18-30 year olds, 72% said their biblical knowledge came “Mainly from being taught” – primarily in sermons. In the second, 7 years later, that number reached 89%. In short – if they hadn’t heard a biblical text taught or preached on, the vast majority of these young adults reported they didn’t know it. People notoriously over estimate this sort of activity on surveys. This sample is from those who had volunteered to help with research i.e. ; probably the super keenos. This also suggests (if statistic 1 is accurate) that, on their own, these young adults must tend to re-read portions of Scripture they are already familiar with, rather than exploring new passages. 21% said they rarely or never read the Bible alone. So 1 in 5 of these young evangelicals only engage with the Bible is a church context. The youngest participants (aged 18-22) were least likely to read their Bibles. Those in their mid-twenties (23-26) read it most, and it dropped off again as they got older (27-32). My speculation is that professional work pressures plus young families mitigate against the good old ‘quiet time’ for those older believers but without exploring further that’s just a theory. 13% reported gaining biblical knowledge from search engines on the internet. Many more reported listening to podcasts and sermons online although the data on how often was unclear. (The influence of online teaching is something I’ll address in a later post). 63% mentioned small bible study groups as an important place of learning for them. 54% did say their personal Bible reading was a source of biblical learning at some level. However, overall, sermons were first and foremost where they learnt about the Bible. What it would be fair to say is that people were self-critical of their biblical knowledge, believed it was their responsibility to address, and yet often struggled to do so. Why is biblical knowledge patchy? Some qualitative findings. Many churches have a “Canon within the Canon”. Despite claiming to hold the entire canon of Scripture as authoritative, evangelicals do not always treat it that way. Many churches have a “Canon within the Canon” i.e. ; the bits that really matter and they teach all the time, while other portions are ignored. This was confirmed by findings from the focus groups I ran. For example, although the story of David, Nabal and Abigail (1 Samuel 25) was unfamiliar to almost all those who took part, they did have a wider knowledge of the Davidic narrative. Groups of all ages made reference to other episodes in that timeline, clearly had a reasonable knowledge of the character and role of David, and had heard plenty of teaching about some of his exploits. This section of the story however appeared to be almost always skipped over and was thus unfamiliar only 1 of the 50 participants had heard a sermon on it. By contrast the story of Elijah healing Naaman’s leprosy (2 Kings 5) was familiar to most but it was clear that the wider stories of the kings and prophets were largely a blank. Many commented that they’d heard this story in Sunday school (presumably because of the commendable slave girl) but it was evident that where this episode fit in the history of Israel, or indeed the Bible, was not something they knew. In fact several commented that they had never heard “the Gehazi bit” (v19-27) a key part of the narrative from a literary point of view. Instead the sermons they had heard repeatedly stopped before that more complex part of the chapter. Likewise Elijah stories were not explained in historical and theological context but rather treated as “one off” episodes. Similarly Acts 12 showed mixed knowledge. Unsurprisingly, it was the most familiar of the three narratives read during the focus groups. Peter’s angelic rescue from prison was largely familiar, but the “death by worms” of Herod at the end of the chapter (v19-24) was unfamiliar to almost everyone. Some even commented, “That bit never makes it into the sermon!” It seems that they hear the same sections of the same narratives on repeated occasions but certain portions – even of those chapters – are habitually ignored from the pulpit or Bible study. Only 18% had heard female biblical characters taught as role models. One final set of data that illustrates this was gathered from a project into knowledge of female characters in the Bible. Of the 50 young women questioned 86% said they had often heard male Bible characters (other than Jesus) preached on as role models but only 18% had heard female biblical characters treated in the same way. Indeed, a quarter of them were unable to name more than 12 biblical women. Many of them, without prompting articulated disappointment and frustration at the invisibility of positive women characters in the teaching they were given. How can we inspire young adults to take greater responsibility for their own biblical engagement rather than being so dependent on front delivered teaching? How do we decide what we preach – and can we be intentional about “plugging the gaps” or paying closer attention to the less obvious aspects within the text while still reading it faithfully? 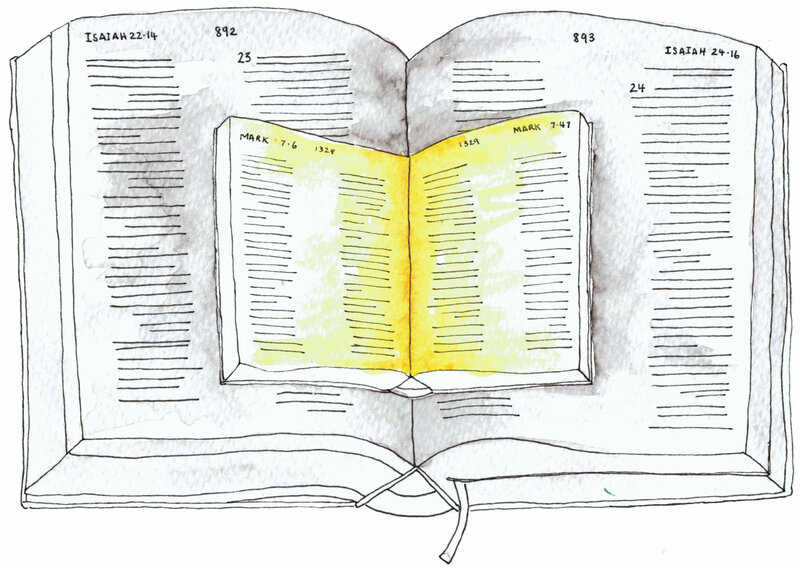 Can we take seriously the whole Canon of Scripture – even the tricky bits and find useful ways of tackling them and inspiring others to do the same? How might we provide an overview of Scripture and not assume young adults somehow “just know” the biblical metanarrative? You may have other thoughts, ideas and even potential solutions to some of the challenges this data raises. It would be great to hear them, and suggestions for resources you have found useful, but it strikes me that we need to take this seriously. People do not learn Scripture by osmosis, and in a society where Bible stories are no longer in the ether or cultural consciousness, perhaps we need to be more proactive and intentional about the opportunities for biblical teaching? Donald S. Whitney “Teaching Scripture Intake,” in Kenneth O. Gangel and James C. Wilhoit (eds. ), The Christian Educators Handbook on Spiritual Formation (Grand Rapids: Baker, 1997), 164. E.g. Bible Society, “Taking the Pulse: Is the Bible Alive and Well in the Church Today?”; Brierley, Quantitative Study: Bible Reading Today: Report of the 2003 Survey London: Christian Research, 2004; Clive D. Field, “Is the Bible becoming a Closed Book? British Opinion Poll Evidence,” Journal of Contemporary Religion 29.3 (2014) 503-28. Wholeheartedly agree with the points raised. Interesting article here (ref Pete Philips) re the impact that technology and social media is having on Gen Y and Gen Z appreciation of the Biblical meta-narrative. One resource we have found helpful is the “Discovery Bible Study.” Admittedly it works best with Gospel stories, so doesn’t address the concerns around holistic biblical literacy. HOWEVER, what it does do is provide a tool for individuals and small groups to actually engage with the text for themselves, rather than relying on it being presented and interpreted for them. We now use this method of reading in our Young Adults small groups every week. Rather than one person reading – we divide into pairs and spend 15 minutes delving into the passage using this framework, which participants are then encouraged to take home and use in their own times of devotion. Discovery Bible Studies work with people at all stages of the faith spectrum by asking open questions. It addresses only some of the valid concerns expressed above of course, but it is one more tool to add to the kit! There are many versions and adaptations of DBS online. 1. Read the Bible story in 2 translations. 2. Now, in pairs, tell the story in your own words. *What does the story tell us about God/Jesus? *What does the story tell us about people? *Is there a principle to apply or command to follow? A very interesting read indeed. Seems to resonate with recent conversations I’ve had of late on this topic. I agree with the patchiness of how we preach – often series tend not to cover the obscure and the difficult but maybe there’s a question about equipping teachers and preachers to tackle more challenging texts? I guess we can’t lead further than we’re willing to go. I’ve used Search the Scriptures (IVF edition!) for 50 years but from Advent 2016 started using daily lectionary readings, which I am enjoying although I’ve no idea what I’ll miss over 3 years, and it is frustrating when a reading is unduly abbreviated.